Dedicated to the war veterans of the United States is an arena and conference center that is home to all kinds of different, exciting events. Allen County War Memorial Coliseum was built in 1946, and has since gone on to host a diverse range of events, including: sports, entertainment, business and educational events. There are a lot of exciting events on the calendar, and you’ll be sure to find an upcoming event that you’ll absolutely love. Some of the events that the Allen County War Memorial Coliseum have hosted include: Komets games, roller derby, Disney on Ice, concerts and even monster truck events! 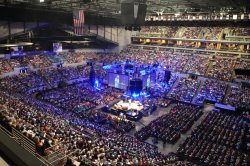 If you are looking to host a major event, conference or expo, Allen County War Memorial Coliseum is the absolute best place to do so in Ft. Wayne. You’ll find that you have more than enough room for any event that you are planning. Check the event calendar for Allen County War Memorial Coliseum to find an upcoming event that you’ll enjoy!